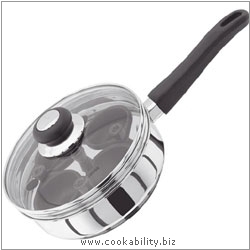 Good value stainless steel cookware. Combines top quality material with excellent workmanship. Tough, durable and easy to clean, superior grade 18/10 stainless steel. Heavy duty thermic base heats evenly on all hobs. Heat resistant handles. Polished mirror finish inside and out. 4 non-stick egg cups. The base and lid can also be used as a sautée pan. Heavy duty thermic base that heats evenly. Heat resistant stay cool handles. Radiant ring, solid plate, ceramic, halogen, gas, induction, dishwasher, oven to 180°C.